As I said previously, I have been busy, busy, busy sewing but can't show much of it. I did make three more tea towels. one will be hand delivered on Christmas Eve. I may still need to make one more, I'm thinking about it. We had our lab Christmas party and I found this amazing recipe online that I decided to make. It was a HUGE hit! I am going to make it for the family Christmas party on Christmas eve. It is a spinach dip Christmas tree!! not the usual Knorr recipe and it is to die for! you can find it here if you need to make one too. Super easy and very yummy! I thought I would show you the latest popular cat toy at my house. Cole loves to shred spongy things. First is his ball, then my kitchen sponge and now this noodle. He just goes to town on it. Last night my daughter and her new house peacock, Stan came for a visit. I was elected to sew yet another peacock diaper! Yes, I really do get to sew ALL the things!! This time DD picked out some fancy fabric for a diaper. So here is the beginning of diaper making. I had Beep's old one to use as a guide, but since Stan is younger and smaller I had to modify it. I drew a pattern from the old one. We had to do several "fittings" to make sure it fit correctly. Eventually, this was the finished product. Stan is a snuggler. If you have followed me for very long you may have seen the past 2 house peas. Gizmo was the first and we lost him at about 10 months. dying from complications of surgery. DD swore no more house peas but as you can see she could not resist Stan. He is happy in the house or in the pen (unlike Beep) but when in the house he needs a diaper. We actually think he may be slightly mentally impaired and may not have the best eyesight. she was sweet to DD just not very many others. I was snapping this photo of Stan and his "mom" when my husband said, "hey, what about me? I have someone that loves to snuggle with me too". then settles in for a nap. Chris calls his name and he bolts over to be with his dad. Here is a photo of Mr Fancy Pants in his new diaper. So as you can see the fun never ends at my house. Never mind that I am *trying* to get ready for Christmas! What are you working on? Please link up with this page and share your fun. 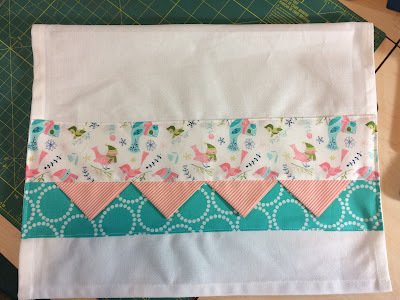 I am also linking up with Sew Fresh Quilts. 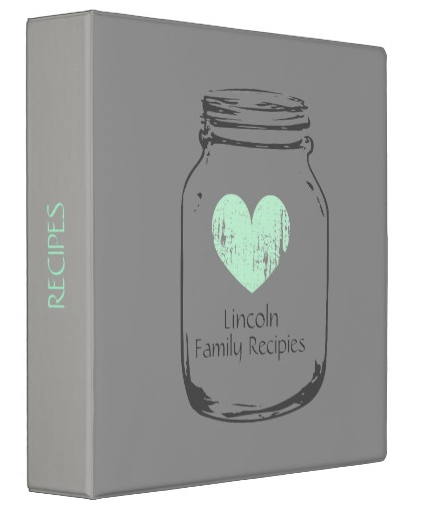 Click on the linky tool to link up! I have been sewing like a mad woman I tell you!! I can't show most of what I have been working on as they are Christmas presents. I did manage to finish two baby quilt tops though. I will show you those instead. Since I have a gazillion baby quilts to make no one will know who these are for, right? I am totally going off grid and making what I want to make, nursery theme be damned! haha. 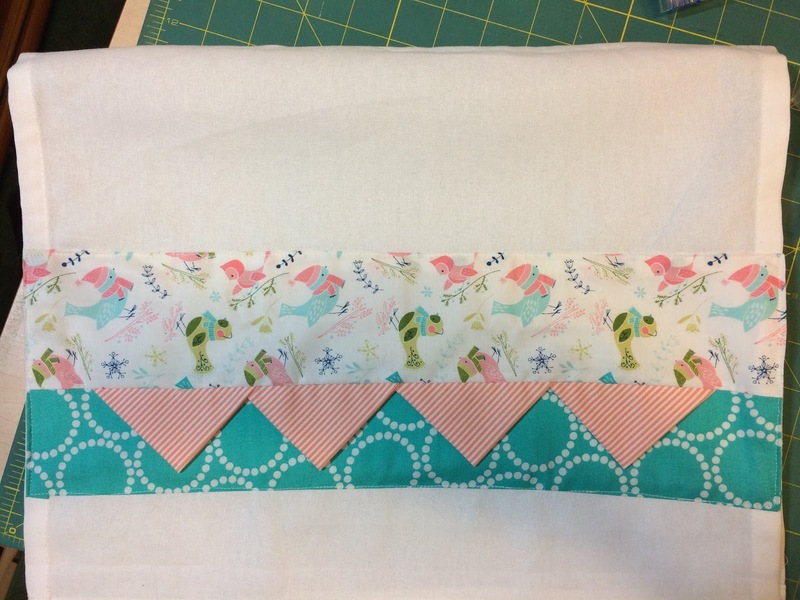 First up is the unicorn baby quilt. I made four paper pieced unicorn heads. The pattern is by Unicornharts. 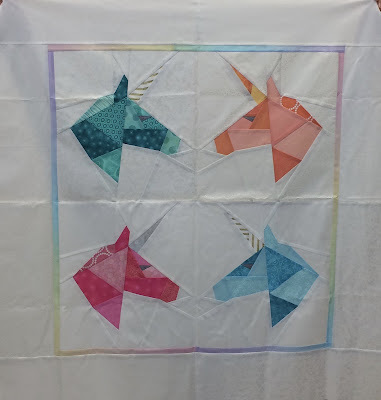 You can find her pattern here on Craftsy if you need some unicorns in your life too! I made all of the backgrounds out of metallic fabrics and most of the horns. I was thrilled to find the pastel rainbow ombre fabric for that inner border and will bind with that too. It is not a big quilt, but babies are not big, right? For the borders I used the background on the opposite corner on each of the unicorns. So the background of the blue unicorn became the border of the teal unicorn and so forth. Look how great that pastel, rainbow, ombre works for that inner border!! 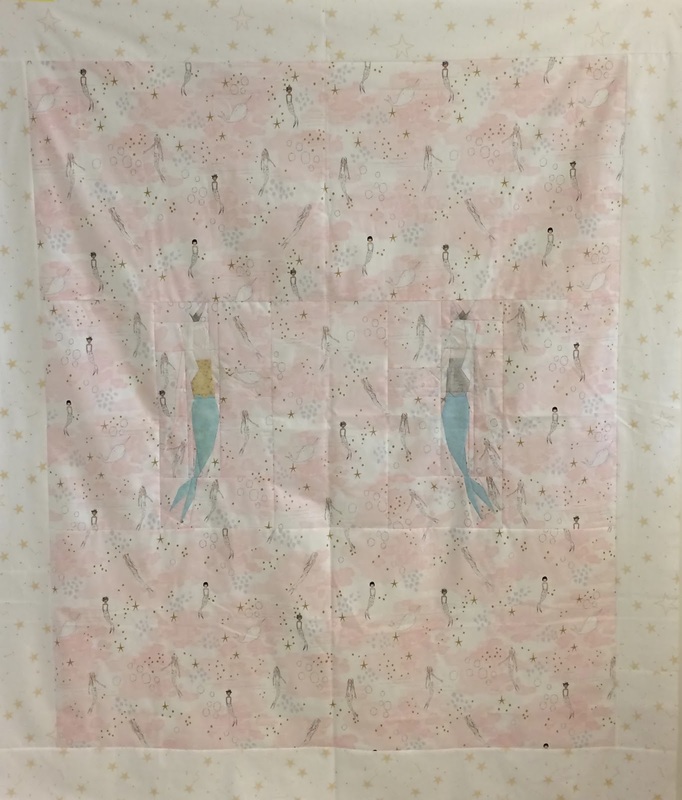 Next up is the Mermaid quilt. You best like Mermaids and LOVE pink for this one, LOL. The Mermaids were paper pieced. I LOVED this pattern by kidgiddy. It went together easily. It was time consuming, as all paper pieced patterns are, but it came together very easily. I would make this pattern again. 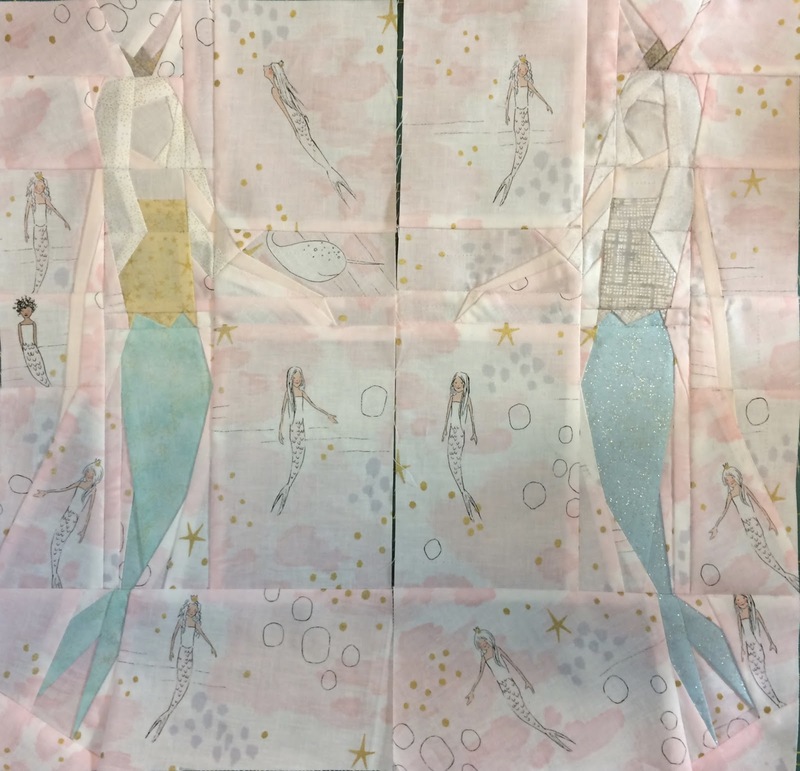 If you need your own mermaids, you can find the pattern here. I chose the theme of silver and gold. The mermaid on the left being the gold one and the one on the right silver. Their tails have metallic silver or gold as does their top and hair. Here is what I put together for the quilt. Very simple, but the pp of the mermaids was what took up the most time. I have the pink mermaid background fabric in minky for the back of this one. As I said lots of pink! Did you happen to notice the metallic stripe in the unicorn horn? That's what I will bind this one in!! 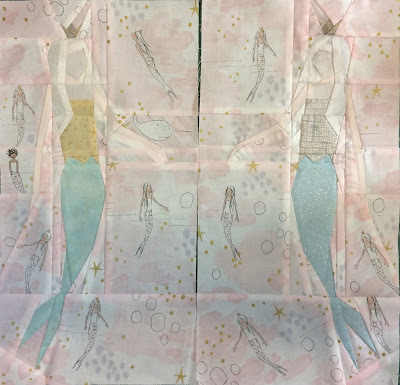 I am planning on doing some hand quilting around the mermaids to make them stand out a bit. Perhaps my LAQ could put some additional batting behind them to help them "puff" out, we will see. She is magic so you never know what she will decide to do! Please share with us so we can be inspired too. A few months ago I picked up this beautiful Singer 66 at the Salvation Army. the bobbin case was intact so I figured why not try it. I brought her home and quite literally didn't even try her out. Well, this weekend when we were cleaning up our living room I hauled her out and decided to see how she ran. I wiped her down and looked up how to thread her (I got the bobbin right the first time). The threading was odd so it was a good thing I looked it up. so I used some Coats and Clarks on the top. I used the bobbin thread it came with and this is the stitch I got. The light works too. I am so excited. The cabinet probably needs to be refinished or painted but otherwise she sews like a dream. I am taking a class next month on maintenance on my Featherweight and hope I can apply what I learn to this machine too. I want to clean up the finish and I am certain it probably needs new oil and to be oiled. Can you even imagine how beautiful she will be then?? Finn was watching the goings on outside while sitting on my Treadle. While Cole was napping on the couch. I just love rescuing old machines. Are you a fan of vintage sewing machines? I got an amazing set of texts with photos from my husband yesterday involving Finn. Finn has claimed my husband as his person. We have had many cats over the years but this is the first one that has really bonded with Chris. So yesterday they had quite the day and I thought I would share. They just finished the laundry and were doing the dishes. Then they made pasta sauce together. Time for a quick lunch break. This is usually the time for some snuggles before mom gets home. I think my boys are happy at home together. They are certainly never far apart! Think Finn can figure out how to get the Christmas decorations in the house and put up? Guess I will have to make Chris do it. It seems like Christmas arrives earlier and earlier every year. I know when it is coming and still I am not ready. Do you have your tree up? Ah, that last one always gets me. I have decided to make gifts for my family. I'm doing pretty well, but I can't show them as they read my blog. I still have some to make though. I also have a couple of baby quilts to get made. Then someone told me of three more expectant moms. I'm not sure I will be making them all quilts though. 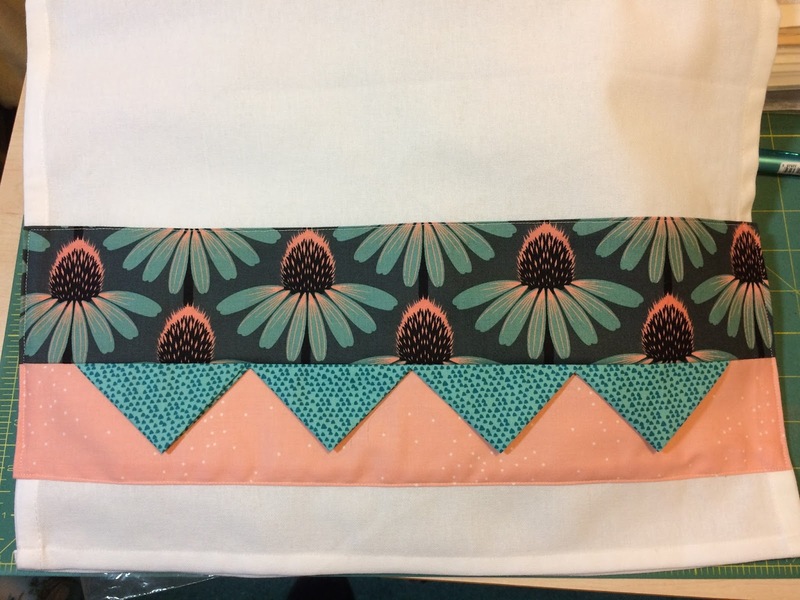 I have come to the conclusion that if the recipient can't find the time to send me a thank you note when I make a quilt, they probably won't be getting another quilt. I'm just putting that out there for all my family and friends to see. Quilts take time and cost way more than people realize to make. Fabric is expensive, then there is batting, thread and I usually pay to have them quilted. This is not inclusive of my time either. if you can't take the time to send a thank you note then I am done making things for you. I will show you something my kids are getting but know they are getting. 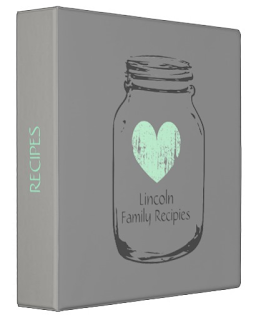 They wanted me to make them a cookbook with all their favorite recipes of mine. I have been struggling to figure out how to do that in such a way that they could add to in the future. I found a website, Zazzle, that does custom binders! I found images that suit each of their personalities. I used stock designs for 2 of them and uploaded photos for the last one. I am printing out all their favorite recipes and putting them in plastic sleeves then in the binders. They are ridiculously excited about this, LOL. So, while I can't show you what I am working on just now, you can see that I am still being creative. A baby quilt top made and a second baby quilt started. Only need to finish that and start the third one. Anything you can share and inspire us with? I hope all my friends had a great Thanksgiving weekend. Ours was pretty low key but nice. What special recipes do you and your family make for Thanksgiving? but much of it I can't share at this time as it is for gifts, sad I know. My daughter in NC sent this photo of her and her boyfriend and their dog, Max. Cole seems to disappear in the lap of my oldest daughter. I took a couple of photos of my son and Finny and isn't this amazing? I love how this picture came out. I made a chenille blanket. This is what it looked like after cutting it but prior to washing and drying it. Once in the washer and dryer the magic happens! If you want more info on making a chenille blanket go to the tutorial section in my header. Look how big Cole is getting!! That is a 24" mat. Also, he and I play "fetch the ball" every day. He was jumping up on my sewing table all weekend and dropping his ball for me to throw. I store batting behind my door so it doesn't open very far. I have to "thread the needle" through the space to throw it for him to go fetch. I finally managed to get a good video of him doing it. Please take a moment and show us what you have been working on. Use the linky button to add your current WIP. I hope that you all get a chance to spend time with the people and pets that you love. God has certainly blessed our family this year. I am very thankful for all He has provided. 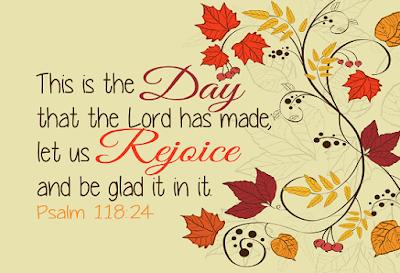 May God bless each and every one of you today and always. I have managed to work on a few things this past weekend and this week. I have LOTS to get done before Christmas. First thing was to clean up my sewing room after Sew Beachy. 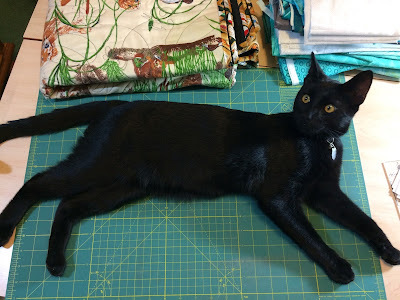 I just kept putting all the stuff on my sewing table. Then when I decided I needed room to sew I realized I had to clean off my table to do so. Cole was right at home "helping" me clean up. I joined a swap online that was to trade soup recipes. We are supposed to be sending an extra with our recipes. It took me a long time to decide what I wanted to send, but I finally figured it out. I saw this tea towel pattern on a website here. I thought it would be the perfect extra! 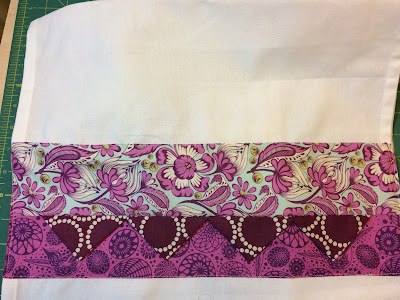 My friend Crazy Quilt Girl is selling the tea toweling if you need to make some too. They are amazingly easy and look so cute when finished! I also received one of my quilts back from the quilter. I decided that I needed to sew the binding on. I managed to get that sewn down so maybe this weekend I can work on getting this finished. I still need to glue it in place, but Thanksgiving is kind of getting in the way, LOL. Shhhh this one is a gift. Thankfully he doesn't read my blog! Cole seems to be the one most interested in helping me in my sewing room. Finn is more interested in knocking things down. They are getting so BIG! This is Finn's favorite position. In the arm of my husband. He climbs up, settles in and shoves his little fluffy face into my husbands face. then he just settles in and sleeps like that. I hope that if you celebrate Thanksgiving you have a wonderful one. You will never be able to get that time back so take the time and enjoy your family and friends. If you are going out for Black Friday, be careful. Pay attention in the parking lots to cars parked next to yours with people in them. If you are uncomfortable, have someone walk you to your car. Human trafficking is real, as is theft! thank YOU all for stopping by and leaving me such nice comment through out the year. I appreciate each and every one of you! 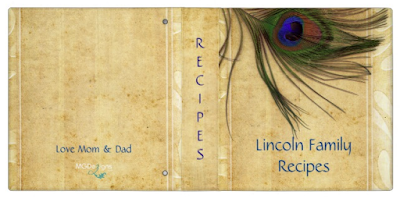 If you have a WIP or 2 that you would like to share please use the blue linky button and share! We would all love to see what you are working on.